Supremely sippable and exotically fragrant, Masala Chai Tea Latte is easy to make at home. 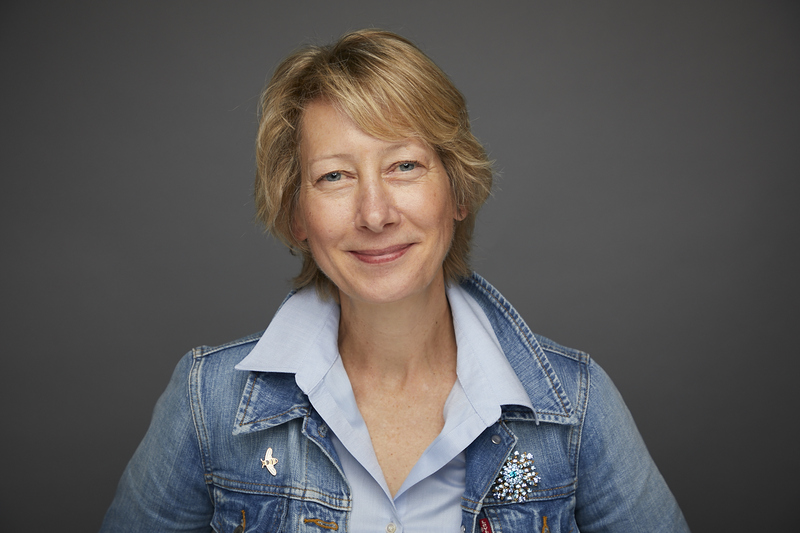 How to Boil Water was an early Food Network show designed for the novice cook. Having mastered water a while ago, I moved on to more complicated recipes, like the time I made boned Cornish hens stuffed with fruited rice pilaf. Brushed with a currant glaze, those little birds were so good to eat. But they also took two days to put together. That was then. Now I want gentler, simpler recipes. Unlike a recent study that indicated Millenials don’t eat cereal because they don’t want to wash the bowl, I’m OK with cooking and the dishwasher. It makes you wonder what the future of meals looks like when cereal is inconvenient. Building your cooking chops may begin with pouring cereal, but it’s not too hard to ramp up your game. Even with limited skills and time, delicious food is a few minutes away. It just takes hot water. Hard boiled (or hard cooked) eggs seem like a no-brainer, but even experienced cooks get tripped up. If your eggs have green yolks, they’re overcooked. The chemical reaction between sulfur in the egg white and iron in the egg yolk happens when the water is too hot or the egg is cooked too long. To cook the Goldilocks, just right, version, place them in a saucepan. Add water to cover the eggs by an inch. Place on stove over medium-high heat. When the water begins to boil, cover the pan with a lid. Remove from heat and let the eggs rest in the hot water for 17 minutes (this time is for high-altitude, lower altitudes require about 12 minutes for large eggs). Remove the lid. Place pan in sink and run cold water over the eggs. 1. Add chopped eggs to salad greens with sliced pickled beets and walnuts. 2. Toast an English muffin and top with sliced eggs, tomatoes and shredded mozzarella. Broil to melt cheese. 3. Gently mix chopped eggs with small spoonful of mayonnaise and another of plain yogurt. Add a handful of chopped celery. Sprinkle in salt and pepper and you have egg salad. Want more flavor? Add a pinch of curry powder to make curry egg salad. Budding cooks may want to go beyond water. 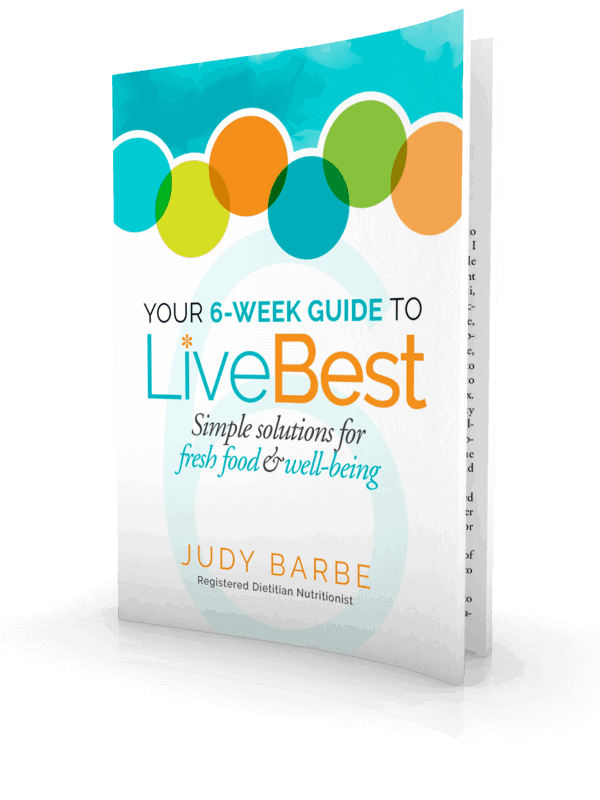 • Read my book, Your 6-Week Guide to LiveBest, Simple Solutions for Fresh Food and Well-Being. I offer lots (and lots) of food solutions. Of course, boiling water isn’t limited to eggs. 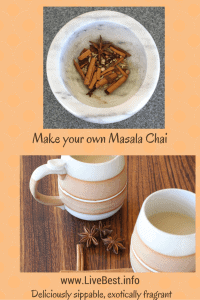 Add some milk and spices and you have Masala Chai. 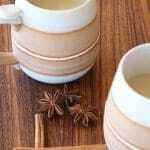 In my Masala Chai recipe I use whole star anise, fennel, cinnamon, cloves, cardamom, and black pepper. Grinding whole spices is worth the fragrance alone. That’s because the volatile oils are released. It’s also why whole spices last longer than pre-ground spices. Once spices are ground the aging process begins which explains why spices lose flavor as they sit in your kitchen cabinet. 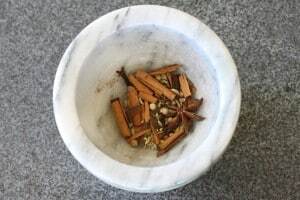 I use a marble mortar and pestle or a small electric coffee grinder that I keep just for spices. Both are less than $20. The mortar and pestle I prefer has a rough interior surface which easily breaks up the hard spices. The more you work the spices, the finer they become. Of course, you can use the ground spices you find at any grocery store, but when you grind whole spices, you realize what a certain spice smells like and how much flavor it contributes. I buy whole spices in ethnic grocery stores. You may have a local spice shop or order online at Penzeys. 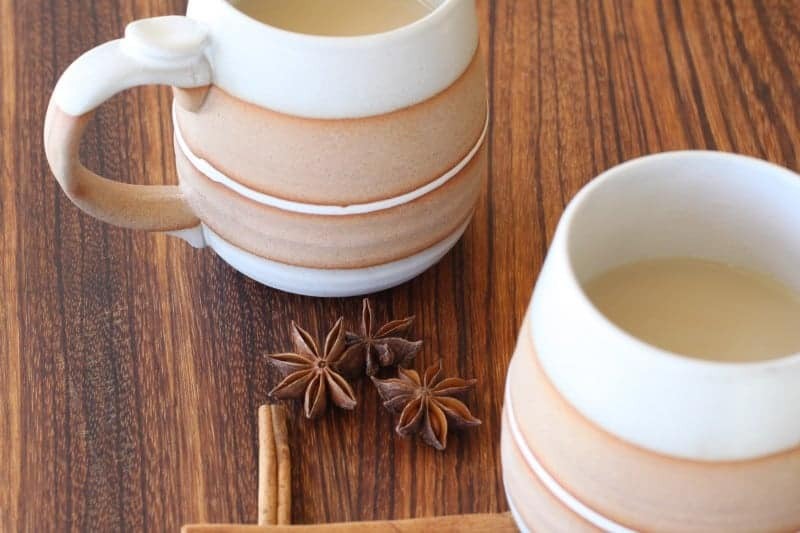 This is a not-too-sweet chai latte that is soul-soothing and delicious. Enjoy steaming hot on a chilly day or ice cold in the middle of summer. 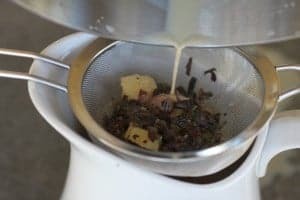 Try these spices in Chai Walnuts, an easy recipe you can nibble on or sprinkle over yogurt or cottage cheese.